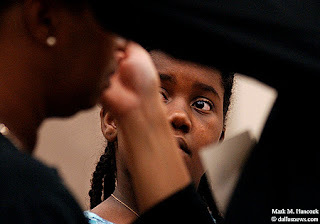 Raven Tippens, 11, (center) of Grapevine watches as Mac Cosmetics representative Jan Flowers of Nordstrom (right) applies make up to Tippens' mother Meshelle Ellison (left) during the first Hair by Hope at Colleyville Center in Colleyville on Thursday, Sept. 18, 2003. Twenty five women on "tight budgets" were pampered with hair styles, make up tips and goody bags. The event was organized by Hope Church of Grapevine and conducted by professional stylists and make up artists. 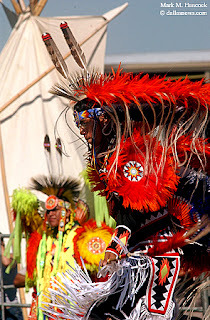 Sammy White (right) dances with other competitors during the 41st annual National Championship Pow Wow at Traders Village in Grand Prairie on Saturday, September 6, 2003.